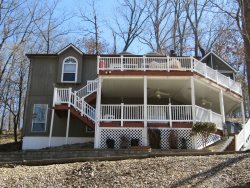 The most prominent recreational activities at the Lake of the Ozarks are, undoubtedly, boating and water sports. Marinas and boat ramps exist at virtually any section of the shoreline. Private individuals operate some while others are associated with certain resorts, condo rentals, lodges and cabins. Whether you own your own boat or would like to rent one, access to boating will be easy. The difficult part may come when you have to make a choice of the many different kinds of boats to rent! Sailboats, pontoon boats, bass boats, motorboats, cruisers, and speedboats are some of the possibilities. The water sport you want to enjoy may help in making the choice as with water skiing. Then again, you may simply want to sit back and let someone else do the driving with a scenic cruise on an excursion yacht. Other water sports include swimming, scuba diving, parasailing, and a list that goes on and on. The Lake area also boasts numerous small rivers that provide excellent canoeing and kayaking possibilities. Again, you can bring your own or rent one from the many rental companies along the river that provide drop-off and pick-up services.